In the “olden days”, you were taboo. It was risky–dangerous, even. People risked their lives for you. They figured nothing else in the world mattered in that moment, face-to-face with your sweet, delicate dough… and they threw caution to the wind and risked tummy aches and salmonella for you. Now you’ve grown up. You’re more sophisticated. You’re less dangerous in the sense that salmonella risk is decreased; however, your tastiness factor has increased exponentially, and for that, you’re possibly more dangerous than you were before. *sigh* You’re just too amazing. A few days ago, I had an awful day at work. Obnoxious customers kept us busy from the minute I walked in until long after we closed. I was tired, I was hungry, and I was cranky–a deadly trio of emotions only a big, fat bowl of you could ail. And ail you did–and then some. Dare I say you’re more amazing than your perpetually baked cousin, the cookie. Something besides stuffing you into cupcakes or pies or cinnamon rolls. Something different, like making you into a frozen treat. Except not like the usual cookie dough ice cream which is 99% vanilla ice cream, 1% measly cookie dough specks. 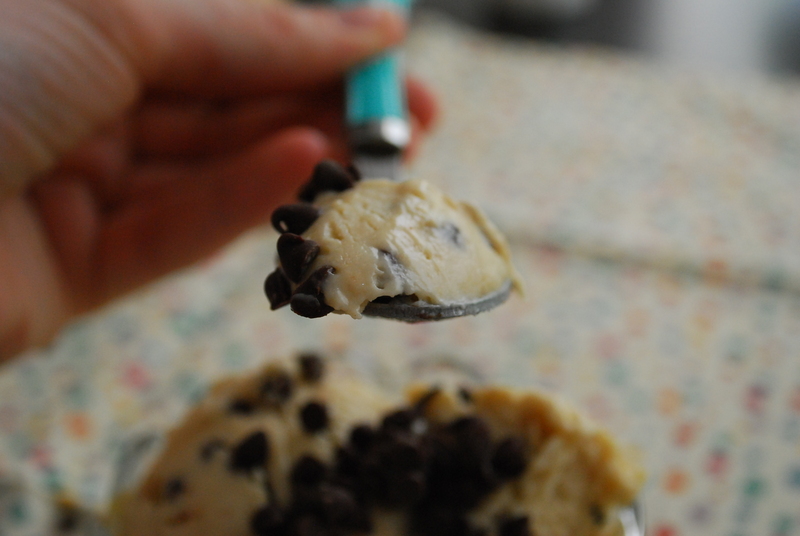 I wanted you to be put to your full potential… full-throttle cookie dough action, if you will. Something unrelentingly brown sugary, some in-yo-face cookie goodliness. Something like Chocolate Chip Cookie Dough Fro-Yo. Um, yeah, I think that is what the doctor ordered. When I saw this recipe over at Two Peas and Their Pod, I knew I had to make it. I pinned it immediately and kept it in my mind knowing that I, too, could make you into this level of greatness. And in my kitchen, you were transformed. Creamy, rich, sweet and surprisingly, light. By using fat-free vanilla yogurt + my favorite low-calorie chocolate chip cookie recipe, I made you into a serious force to be reckoned with. One I enjoyed in a cone, in a bowl, and with a spoon, straight from the tub numerous times over the weekend. Cookie dough, I love you. 1. In a freezer-safe bowl with a tight-fitting lid, combine the butter and sugars with a rubber spatula and stir until creamy. Stir in the vanilla and the milk. Lastly, gently stir in the flour and salt to combine. Dough will be soft. Stir in the chocolate chips. 2. Fold the vanilla yogurt into the cookie dough until fully incorporated. Cover with the lid and freeze overnight. 3. Store the fro-yo, tightly covered, in the freezer. This makes about 2-3 cups of fro-yo. The texture of this fro-yo is creamy and sturdy.. almost like ice cream rather than the soft-serve kind typically found at yogurt shops. It holds well in a cone and tastes delicious no matter how you serve it–I honestly prefer mine straight from the tub! 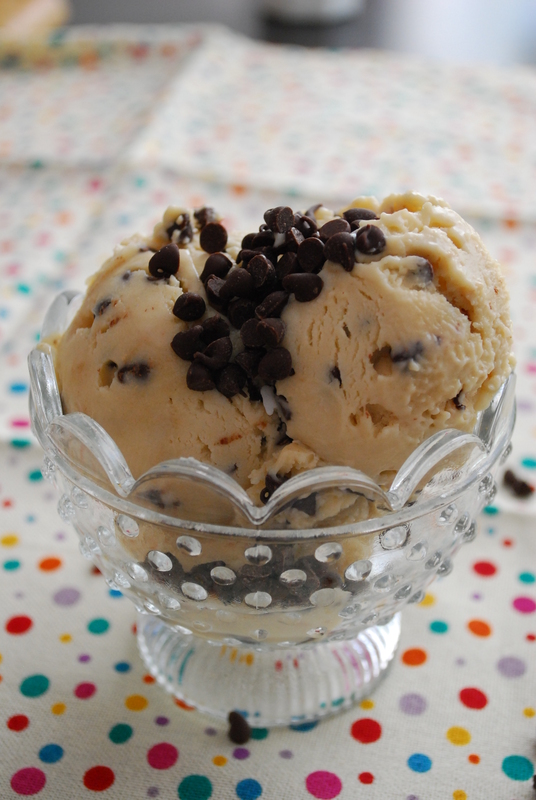 And for those of you who dislike cookie dough ice cream for the lack of cookie dough (uh, me), then this is for you. 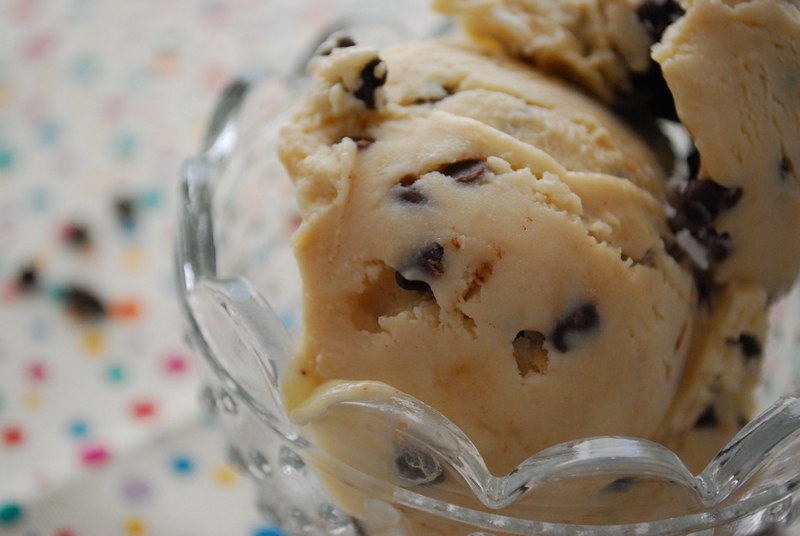 There’s no vanilla in the way–all cookie dough here! Plus, it’s lightened-up so you can justify eating a tub and it’s practically considered health-food. I hope you enjoy!! Please make this, it’s seriously amazing. There is nothing more romantic than a girl and her cookie dough! It is an affair to remember! I do love cookie dough too. It’s just so satisfying! I like your Fro yo version! Me thinks I shall try some! I can’t keep cookie dough anything around or I eat it non-stop until it’s gone. I would totally devour this! Oh I freaked a little when I saw Maria’s recipe too. I think I shall make this weekend! Yeah! That’s why I’m always the jerk who digs the cookie dough pieces out, haha. This was the perfect solution! 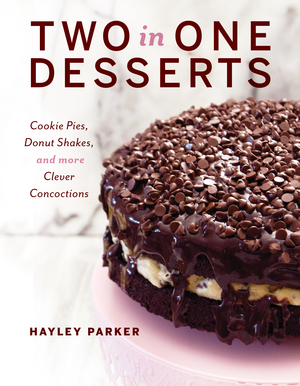 Hayley it looks amazing and would be a bit too dangerous to keep on hand 🙂 Cookie dough has that effect on me! Looooove this. Cookie dough is my weakness. Yeah, pretty much can do no wrong in my eyes. Oh my, I totally need this in my life. 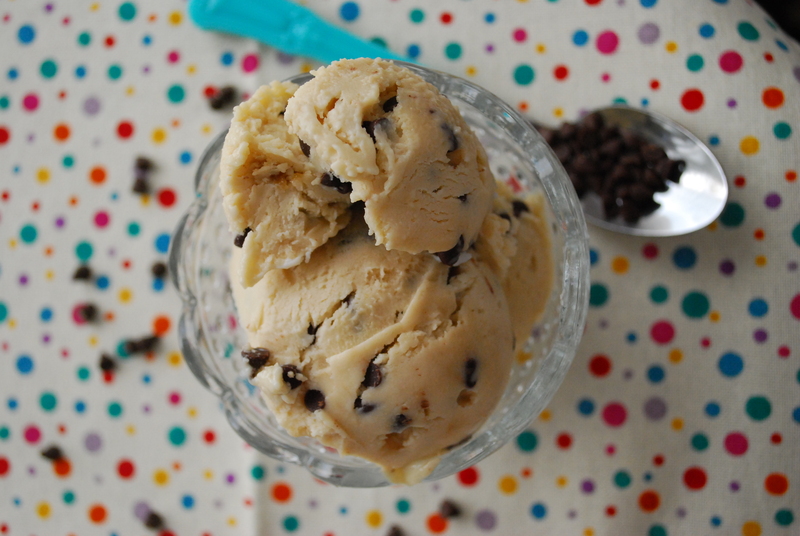 I can eat ice cream like there’s no tomorrow…and in cookie dough form!?!? Eek, I’m breakin’ out the elastic waist pants. Lol, I need some! Mine are tiiiiiiiiight but man, this is too good to stop! I made my first Fro-Yo yesterday and loved it! Have to try this next. Cookie dough fro yo without the annoying vanilla ice cream in the way? This sounds too good to be true! I have got to try this! You are brilliant. Yesterday all my brain could think about was “Frooo Yoooo Chocolate Chip Cookie Dough Frooo Yoooo” so I gave into that feeling and made this 🙂 It is SO GOOD and SO EASY and SO ADDICTING. My taste buds were major confused but major happy about these flavors and textures. 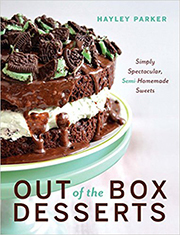 It’s the kind of thing that will become a staple and signature among family and friends! One qualm: there was a wee bit of a strange flavor going on. A certain tang, a certain tingle on my tongue. Is this the baking soda? It doesn’t take away from the Fro Yo, and decreases when fully frozen, but it is intriguing and might be off putting to some. Dear Hayley, thank you for creating this. As a diehard cookie dough lover it is everything I never knew I needed. Imagine all the possibilities? Monster cookie dough, snickerdoodle cookie dough, sugar confetti cookie dough, pb&j cookie dough, etc. Endless, I say, ENDLESS! Hey Megan!! I’m SO glad you made this and even happier that you loved it! Yes, I noticed that tang too and at first, thought it was the yogurt but you’re right–it’s probably the baking soda. Next time, I’ll omit that, and I’ll alter the recipe (obviously it’s unnecessary since you’re not baking these anyway). Thank you!! I’ve been pretty obsessed with cookie dough lately. This looks awesome! I saw this recipe too and have been dying to try it! I like that you lightened it up too! 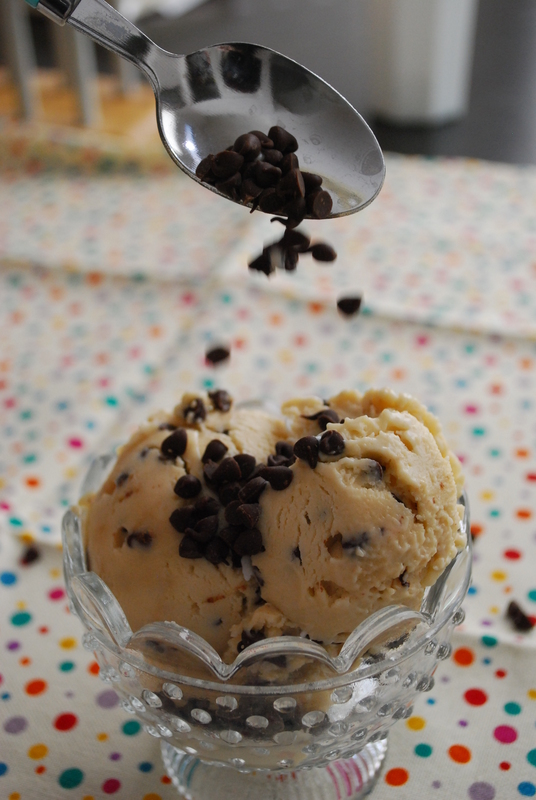 I always get annoyed when I buy the cookie dough ice cream…because there is never enough cookie dough chunks. Duh! That’s why I buy the stuff! 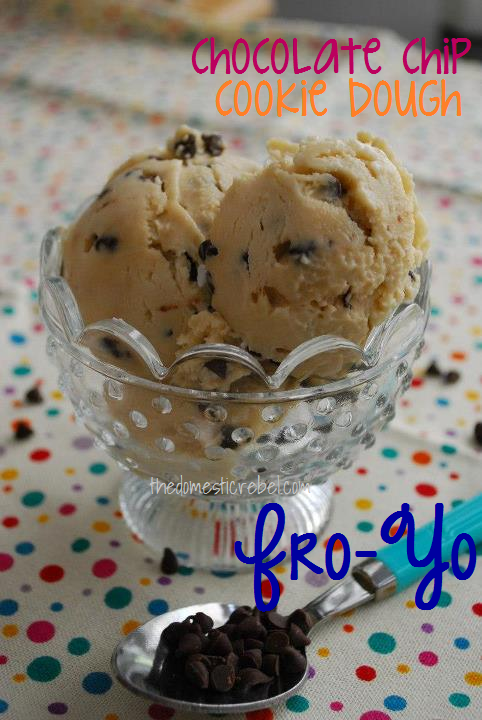 You are a genius to create an all cookie dough froyo…I want the entire container now!!! Exactly why I loathe buying the so-called cookie dough ice cream. This stuff is addicting AND the perfect solution!! I think this is the best love letter ever written to cookie dough…ever. Would Splenda be okay to use instead of regular sugar? Also, any estimate on the calories of this? Looks awesome! I made this last night and let it freezer overnight…the only thing I did differently was used Splenda instead. I tried it this morning and found that it’s hard as a rock..like nearly impossible to scoop out. Is this normal? Do I just need to let it sit out for a few minutes before trying to scoop? Or did I do something wrong? Hi Erica, if I remember correctly, it was quite hard! Let it sit out for a little and use a hot ice cream scoop to help scoop out the froyo. Let me know how you like it! I made this tonight and only used 1/3 cup chocolate chips, which helped the nutritional value. I figured it made 6–1/2 cup servings and 8 WW PPV for each 1/2 cup. 1,967 calories in the whole recipe. If you were to eat the whole thing! Wish I had never found this…I’ll be making it all summer….it’s soooooo goooooooddddd!!! I wonder what I would have to change to make it with regular yogurt. My kids don’t like the tang of Greek yogurt….of course my theory is…more for me! I used the regular size chips and they are too big..will use the minis next time! More for you indeed! I’m not quite sure how it’d work with regular yogurt, but one of these days I’ll give it a try! Thanks Jennifer!! This ice cream was great love cookies!!!!!! So, if I wanted to use my ice cream maker, i wonder how i could??? any suggestions? Hi Kelly! I wish I could be more of a help but I don’t actually own an ice cream maker and therefore I’m not sure! This recipe was designed to be made without one for people who don’t have one, so I don’t know if it can be done with one. I apologize! would it be possible if you could put the measurements in grams please? really want to use your recipes, but not sure what a cup equates to. How did it spoil when it was in the freezer the whole time, I’m wondering? 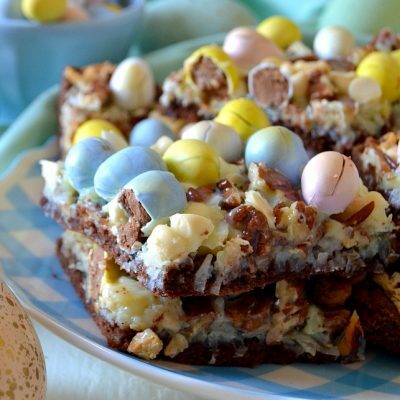 I will definitely get this chocolate chip cookie dough for my kids this Easter weekend!